Minimum order is 50 coolies. Pricing as low as $0.94 each. 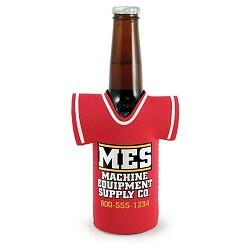 Our Jersey can beverage holders are the most unique beverage holders and come in various themes. We have firefighter, police, scrub/medical, sports and flapper themes available. 2 sided art is included at no additional cost and shipping is free if located within the contingent US. 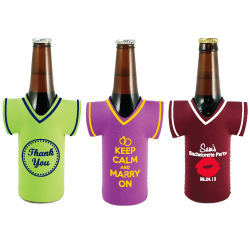 These definitely make a statement for your team or command just by personalizing with your name, department or group. Please ask us about teams that want individual names or numbers. Available also in camo or for cans. After you place your order you will receive a free email proof from our expert team of designers.